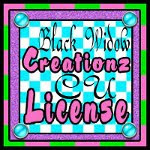 Here is a tag I made with the fun winter kit by Creative Scraps by Crys called Snow Cold! It is PTU and you can find it at the stores she sells at. And your tube of choice. I am using a tube I purchased at a store that no longer exists, by the very talented Keith Garvey. However, you can still find this tube and many other wonderful tubes of his at his own store- http://garv-girlspsptubes.pinnaclecart.com/index.php?p=home When using his art, you must also have a license number and have it displayed within your creation. Ok let's start on this tag. Arrange all these layers as shown, you may have to scale a few down just a bit. Add drop shadows to elements 27, 26, 52, 50, 30, all the copies of 28, and frame 4 by going to FILTERS>LIGHT & SHADOW> DROP SHADOW with settings at 3/3/7 black. For element 25, you will need to right click on element 50 in the layers box and choose ALPHA TO SELECTION and click back on element 25 in the layers box to make it the active layer, then zoom in and use the eraser tool. SELECT>NONE then also add a drop shadow with same settings to this element. 2. Using the rectangle select tool, crop a selection of the frame, making sure that paper 7 is selected as the active layer. Go to LAYER>CROP TO SELECTION. 3. For the mask, add the mask as a new layer, scale to 956 x 698, then COLOR>INVERT and LAYER>TRANSPARENCY>COLOR TO ALPHA. Right click on the mask ALPHA TO SELECTION then click on paper 3 in layers box. SELECT>INVERT and EDIT>CLEAR. The paper is now the mask. Delete the original mask layer. 4. Add your tube of choice, don't forget to include all the copyright info- artist's name, website, and license number if applicable. Add drop shadow to the full body tube. For the effect in the window frame, I took the close up tube and COLOR>DESATURATE then went to mode at the top of the layers box and chose overlay. I then duplicated the tube. Again, make a rectangle selection with the rectangle select tool around the frame and go to SELECT>INVERT and while the close up layer is selected, EDIT>CLEAR on both the close up tube layers we just put in the window frame. 5. Add your text, I used a font called Vladimir Script in white. Right click, ALPHA TO SELECTION, SELECT>GROW by 2, and fill with a powder blue shade. Add a drop shadow. 6. Save now as a .xcf so you can come back and make changes per layer if need be at a later time. 7. Merge all layers down UNTIL YOU GET TO THE SHADOW ON THE FRAME. The animated snow needs to be behind this. So stop, and then click the next layer and merge down. You will have 2 layers then- the top is everything with the shadow of the frame and above, and the bottom is the paper and mask. Add a new WHITE layer, go to COLOR>INVERT then FILTERS>NOISE>HSV with settings at 8/0/0/255 then FILTERS>LIGHT AND SHADOW>SPARKLE and just slide the spike density all the way over to the right. Click OK. Then go back up to COLOR>INVERT then to LAYER>TRANSPARENCY>COLOR TO ALPHA to make it transparent. Make 2 copies of all the current 3 layers in the layers box so you will have a total of 9 layers. Arrange as top with tube layer, snow layer, paper layer, tube layer, snow layer, paper layer, tube layer, snow layer, paper layer... Now, on the top snow layer, drag the snow layer up a bit. Use the rectangle select tool to crop the snow within the window area LAYER>CROP TO SELECTION. Merge the top 3 layers together (tube layer, snow layer, paper layer). Make it an invisible layer and then work on the second snow layer. Do not move this layer, but again, crop this like you just did in the first snow layer. Merge the three layers together and make it invisible too. Now work on the last snow layer, drag it down a little. Crop to selection like you did with the other snow layers. Merge these three layers together, then make all the layers visible again. Make sure white is your background color then right click and REMOVE ALPHA CHANNEL in each of the 3 layers. While the top layer is selected go up to IMAGE>MODE with the color dithering chosen to be Floyd-Steinberg (reduced color bleeding). Click CONVERT. If a window comes up asking to crop, just hit OK.
6. Export your image as .gif with As animation checked and Loop forever checked and Use dealy entered for all frames checked. In the box for delay time (milliseconds) choose about 300. Click Export. Save your image to a site like Photobucket or Fotki to keep the animation.